Space is still available for one of DACH's favorite events! Private guided tour of art galleries the evening before La Nuit des Bains for the public. Mamco art historian and curator Samuel Gross will guide you through his choice of current exhibits, over 1.5 hrs. Meet at Gallery Truth and Consequences, 7 boulevard d’Yvoy, 1205 Geneva. Followed by dinner at local restaurant. 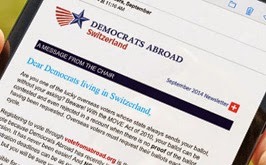 Fundraiser for Democrats Abroad Switzerland.